As usual, I’m lagging a bit (you know, a month, or two behind) on my projects and posts. I completed Space Paste/Spring Leaf project #5 for May. There was only one stipulation for the month: ephemera. 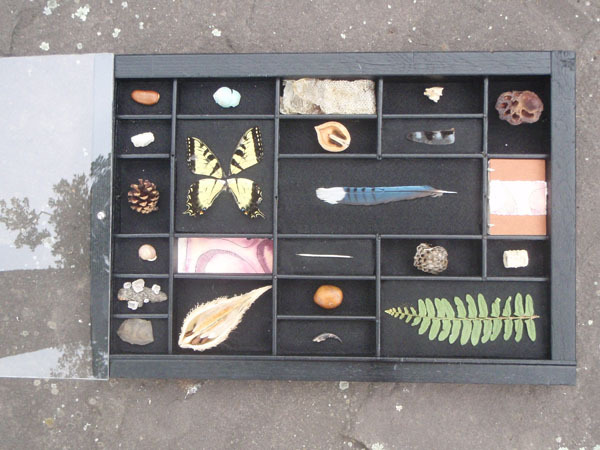 I have a small collecting problem when it comes to natural objects. 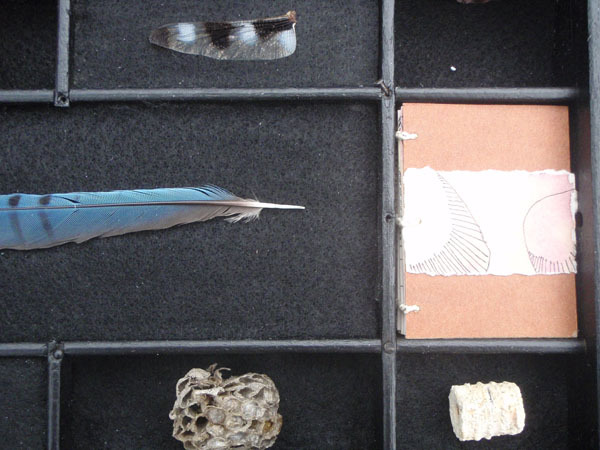 Feathers, stones, twigs… they all end up in my pocket. This seemed like a perfect opportunity to reduce the piles of snail shells and seed pods cluttering my living space. With the help of a friend, I turned a warped job case into two curiosity cabinets. I placed a transient treasure in each compartment. 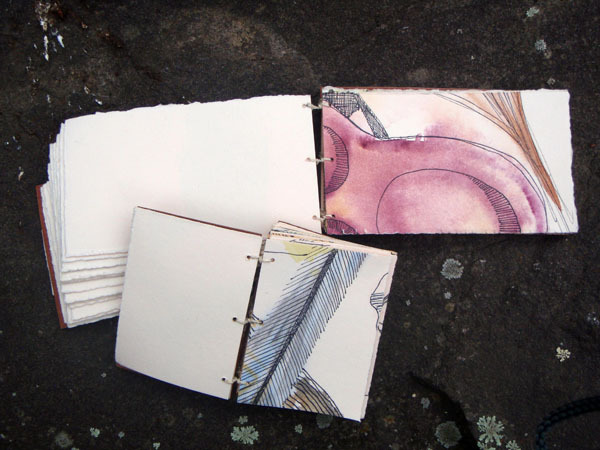 Except one- in that compartment sits a small book filled with abstracted watercolor and ink drawings. I was pleased with my creation. Until I visited the Lilly Library in July and got my hands on (thanks, Jim!) Wunder Cabinet by Barbara Hodgeson and Rollin Milroy. And may I just say, squeal! 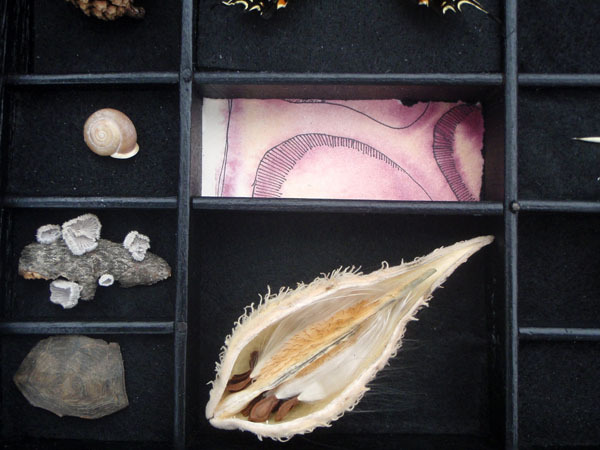 Inspired by the wunderkammern of Germany, these two constructed a beautifully crafted two-layered box containing an assortment of flora, fauna and oddities. 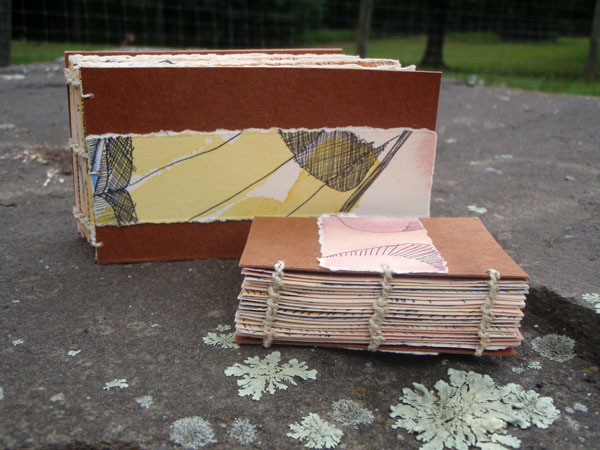 Each piece is cataloged with curatorial diligence and corresponds with one of three books (paper made by Reg Lissel) included in the package. 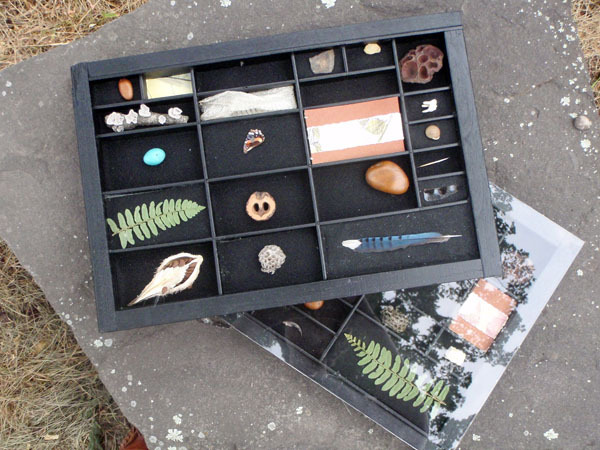 It was a delight to sort through each compartment and discover the keepsakes waiting for me. Thanks, Barbara, for showing me how it’s done.